Emil Guillermo: The fight for our legacy communities in New York’s Lower East Side and around the U.S.
I’m sad to say I’m stuck out in California and won’t be in New York for the big AALDEF dinner this Wednesday when it celebrates 45 years of fighting on behalf of the community. But if you’re on the East Coast, I hope you’ll be there in person to celebrate the organization that after all these years is not giving up or resting on its laurels. On Friday, AALDEF filed a lawsuit in New York challenging the city’s approval of luxury high-rise developments in the Lower East Side of Manhattan that would threaten Chinatown, raise property values, and displace low-income Asian and Latino residents there. Just as AALDEF in the past has fought for workers’ rights, the fight for the future is now focused on protecting our community’s right to remain in our homes. Call it what you will. “Gentrification” is the common term. Mature neighborhoods get a redo and an update. It’s capitalism in action. How do four luxury megatowers, with nearly 3,000 new units, in buildings up to 80 stories with great waterfront views, sound where there was once a laundry and a grocery store? Developers get a big payday, re-till the area, maybe a Whole Foods moves in. Meanwhile, residents, mostly long-time renters, get shoved out of the picture into the trash bin of progress. Who will stand up against the developers and their backers in government? AALDEF is leading the charge with its lawsuit, Lower East Side Organized Neighbors v. The New York City Planning Commission. 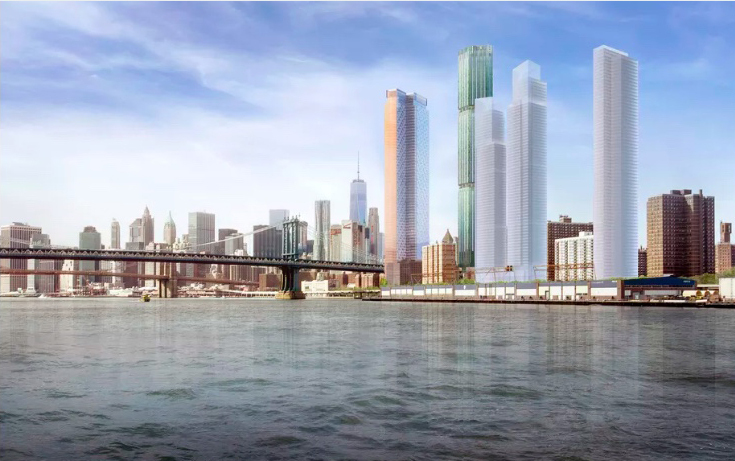 The suit claims the towers are out of scale and in violation of the zoning laws, violate environmental quality procedures, and have used loopholes to increase the height of residential buildings. Stopping the projects based on building codes and zoning regulations is one thing. That’s the legal fight. What gets lost in the real estate fine print are the human costs of replacing the people who call the Lower East Side home with new wealthy high-rise dwellers. That’s the bigger fight, often overlooked. What’s real in real estate has always been people. It’s simpler to think of empty buildings like Monopoly pieces. No one thinks of the people inside them. No one is concerned about the devastation of a community until it’s too late. My Filipino parents were always renters in San Francisco. My family was always on the move. When I had a little success, I owned some real estate. But I hated being a landlord. I bought high and sold low. Now I own only my home. And not in the super-gentrified city I was born in. Mark Zuckerberg owns my old neighborhood now. I moved out into an almond orchard. I gentrified dirt. I’m not against people making a profit. My bias is against the people who see real estate as their opportunity at the expense of the poor, who simply lived their lives, stayed in one place, and saw their homes skyrocket in value without them. Now they’re being pushed out. And thank goodness, AALDEF is there to make sure someone is fighting for the community. Pay attention, because this pattern will be replicated block by block, building by building, in every Chinatown, Koreatown, Japantown, and Filipinotown in America. It’s already happened to some degree, but will accelerate as prices go higher. Wherever we were allowed to live in the past has now grown in value. Some of us were able to participate as owners. But many of us haven’t. And even if we’re owners, it’s not just about money. The community has changed. Home is no longer home. I was talking to some artists who told me they’re planning a show in San Francisco’s Japantown in the coming months to publicize how developers are talking about buying portions of the fabled area. It’s certain to change the community, the shops, the residents. It was just a coincidence that I heard about it at the same time as the New York lawsuit. But it showed me how this is something that’s not confined to Manhattan. Fighting for our homes and communities and our right to be there. That’s the fight of the future. Pay attention to AALDEF’s battle over the Lower East Side. It’s a story that will surely be replicated around the country in all our Asian American legacy communities. It’s also good to know that after 45 years, AALDEF is still fighting for us.